We have a half-acre lot which when we moved here in 2006, was totally devoid of any vegetation in the back yard except for a combo of hydro seed, straw and weeds. Lot size is 200 feet by 100 feet. We fenced in the back yard the first Spring we were in the house. I really wanted a vegetable garden, which I crazily made 100 feet long by 4 feet wide. When I was a kid, my Dad had a vegetable garden which my sister and I were told to weed as an ongoing project throughout the summers. That garden was about 20 feet long by 4 feet wide. So we would bribe our friends Steve and Paul to help with the weeding. The bribe was that our Dad would take us all to a local convenience store for frozen fruity beverages after we were finished. I hated weeding then! I still hate weeding! By the time I finished weeding the 100 foot garden, it was time to start over again. So what was I thinking when I created this huge garden? I ended up planting about 25 different vegetable and fruit bearing plants. I was amazed by the bounty, however in subsequent years, I struggled on a mini scale with the same plight that the local farmers were dealing with – drought; disease; flooding; hail; bugs; and finally a Nor’easter came and knocked down my corn field breaking the stalks 6 inches from the ground. The garden currently, consists of blackberries, mint, strawberries, chives, wisteria, black-eyed Susans and lilies. Someday, those plants will take over the yard, and the neighborhood. The end result, is that I just buy most of my vegetables and fruit from a local farmer’s market. In the long run it is cheaper and less stressful, plus it benefits the local farmers. Peel and core onion, and slice or dice. Microwave onions for two minutes in a microwave safe container. Stir the onions and microwave them for an additional minute. Use a heavy 3-4 quart pot, add olive oil on medium heat. Place onions in pot, stirring it so they don’t burn. Microwave peppers for two minutes, then add them to pot. Cook the onions and peppers for 5 minutes stirring to keep from burning. Add garlic and cook for another minute (do not allow it to burn). Add Worcestershire sauce, crushed tomatoes, tomato paste, herbs, sherry and cook for 10 minutes, stirring frequently. 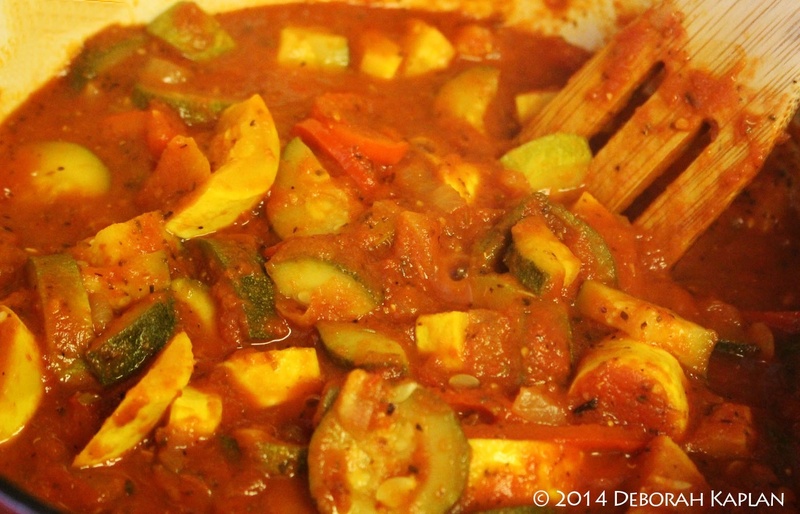 Add zucchini and yellow squash and cook for 10 minutes on low with the lid on. Stir items in pot, and cook for another 10 minutes on low with the lid on. Continue this regime 4 more times (total of 60 minutes) or until zucchini and squash are tender. Be sure to stir every 10 minutes so sauce on bottom of pot does not burn. Place cheese on table, to be sprinkled or spooned on top of ratatouille. 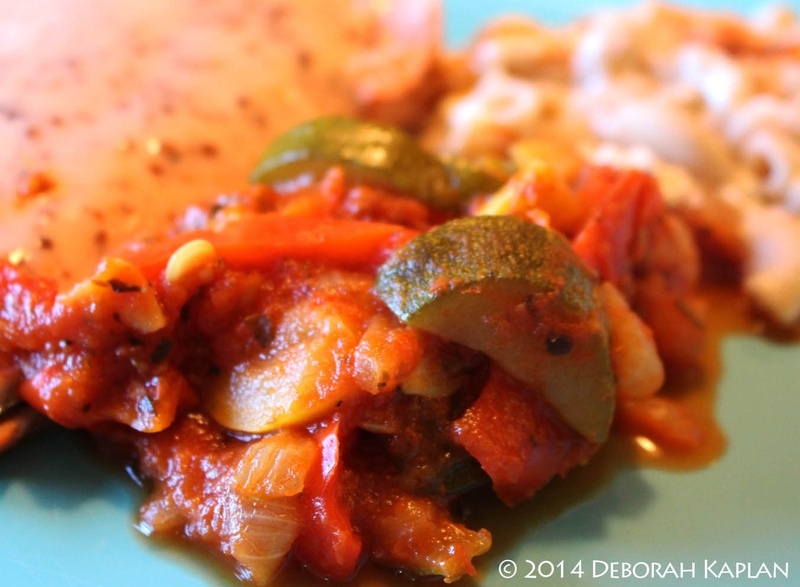 I serve this ratatouille as a side alone, on top of couscous, angel hair, rice, quinoa, or mac & cheese. We love this recipe as a topping on pasta, rice, couscous or quinoa.